I am so, so sad. What is happening to our beloved party? To which I have belonged for nearly 50 years, having joined the Young Socialists at the age of 15. Yes I have always been on the left of the party, but that’s fine – like any democratic organisation we are an amalgamation of those with differing points of views and sometimes the votes at conference may not agree with our individual wishes. But that is democracy – or what I have always believed. I voted for other candidates in the last few leadership elections, but supported those elected as I believe a loyal member should. I will do the same this time if my choice is not that of the majority of my comrades. However I honestly believe that Jeremy Corbyn will be the best leader for us and want him to win. I have followed his career for years and know him to be someone of sincere views. On a personal note he supported a long campaign with which I was involved with modesty and compassion. Just as I would expect. The party introduced the £3 supporters ‘ticket’ to allow non-members to join in the election process. And are now complaining about the possibility of ‘infilitration’. They are of course mentioning militant tendancy, communists and other ‘far left’ groups. My immediate fear on the announcement of this innovation was Conservatives and others joining to skew the votes. Ed Miliband’s election to the leadership ticked all the right boxes for the party hierarchy but he proved unelectable in this year’s General Election. So the claims that Jeremy Corbyn could prove unelectable to the electorate in five years time are, seriously, laughable. I do a bit of political blogging and normally would be out there giving it a go in support of Jeremy. However there are too many party members showing disloyalty and divisiveness to the country that it has taken me a time to even think about publishing this blog. I am not attacking those who oppose me and others who agree with me. I just ask them to moderate their voices a little. I am going to do that boring thing that old people do. I am going to repeat myself and suggest that anyone wavering about the state of the country and what is the difference between Jeremy and the other candidates read a book. Not great literature [I was an Eng Lit lecturer in an earlier incarnation] but a reminder of why the Labour Party and the Trade Unions came into being. And why we need Jeremy Corbyn as our leader: ‘The Ragged Trousered Philanthropists’ by Robert Tressell. Read it, weep and then vote for Jeremy Corbyn. 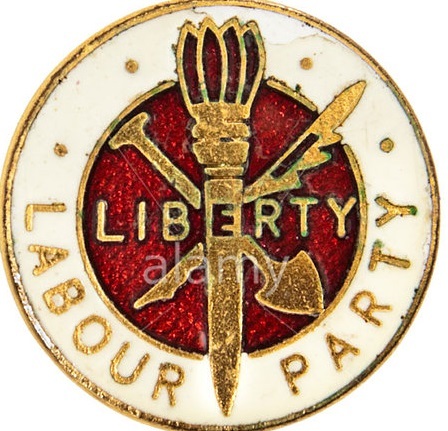 Photo: The old Labour Party Badge. Lovely isn’t it? This entry was posted in Democracy, Party Organisation, Propaganda, The EU, Unions and Political Activism and tagged Jeremy Corbyn, Labour Party Leadership by adminthinkleft. Bookmark the permalink. Excellent blog. I was initially voting for Andy but have watched Corbyn and am impressed. I’m fully behind him now. He is a breath of much needed fresh air, and more importantly I believe he will be a great leader. I’m looking forward to him unsettling Cameron with his calm, self assured demeanor. Good blog. About 18 months ago I couldn’t take any more of the Labour Party so I joined the Green Party which is very close to my socialist beliefs but it would of course would take many years to grow into an electable force and with our nation being destroyed by the Tories we don’t have the luxury of time. Jeremy as leader of Labour would almost certainly entice me back into the fold. My father was a coal miner in the 50’s, a life long trade unionist and labour supporter. He was a kind and principled man, with strong socialist values. He gave me a copy of Ragged Trousered Philanthropists. I read it and wept, I’ve been a Labour supporter ever since. Jeremy Corbyn gets my vote. Thank you for publishing your article, it was heartening to read your views. Yes. I wasn’t a member from youth, took awhile to get there, but then spent a few decades as a loyal though often disappointed activist through the Blair years. In that critical period after John Smith’s death I was a Constituency Chair & found myself on telly grilled by Rawnsley about who I wanted for Leader. I wanted to say Prescott but had been told by our Organiser not to favour any candidate at that critical stage, and being more wary of the Press than we were of the Party ‘grandees’ then, I complied. Ever since I have kicked myself for not speaking out, it was the moment Blair & Mandy wanted time to manoeuvre their advantage. Decades later then, there’s a chance to regain genuine Labour, the bit that cares more about principles than power, more about acting together than genuflecting to winners, more about equal chances than dissing the weak. When I hear mutterings about how people signing up as supporters aren’t ‘real’ Labour I think that maybe The ‘real’ Party has never been New Labour & power focussed, and that at last there’s a chance to rebuild the power of the people to reshape all those personal hopes for the future into an energetic movement of change. Like freethinkeruk I’ve gone Green, climate is after all THE threat to everyone’s future. But Corbyn recognises that too, and if I’d known before he’d be on the ticket I may not have moved over. Here’s hoping for a big coalition of the Left. It may be too late to rescue the UK as the compassionate society it once aspired to be, but it may be early enough to make a difference. I’d love to believe Jeremy can win a general election but I just don’t believe it adds up. It’s blind faith with no conception of what voters we need to win over and how. That’s why I’m backing Andy Burnham. BUT I will back Jeremy Corbyn to the hilt if that is who we elect and I will fight tooth and nail for a Labour victory even if I don’t think it at all likely (maybe I’m wrong or maybe I’m kind of right but we get a bit of luck and can do just enough to get the right kind of hung parliament). Whether we’re backing the same people in the contest, you’re my comrade and we need to stick shoulder to shoulder to stand any chance of getting this government out. I read The Ragged-Trousered Philanthropists in the 1960s and in my option not a lot has changed since then. I’m voting for Jeremy Corbyn also. I don’t believe that Jeremy Corbyn could not win a General Election. Firstly despite what the Labour hierachy say he is more in contact with ordinary votes than any of the rest of them. In addition one has only to look at the SNP’s 2015 Election Manifesto to see how close their policies are to those being put forward by Jeremy Corbyn, and then look at what happened to the Labpur vote in Scotland. To see some real social demoncracy at last begining to surface gives me a profound hope for the future of this country. Not since Wilson has a left wing politician ran the country and if corbyn gets in we wont see a Labour leader take office for a very long time this election is a dream for David Cameron if corbyn gets in jobs done for the blue boys, middle England will not vote for left wing party politics you have to play the game, its always easier to fight from within than to be banging on the door from the outside it has to be Andy Burnham for me. Middle England is a very small group of people. Labour needs to mobilise the working class and it can’t do that with people in charge who have more in common with the Tories than the Labour movement. Burnham did not vote against cuts to the poorest and most vulnerable people’s meagre ration of fiat. Because Harriet Harman told him so. Think about that. Now that’s unelectable. Sadly Brian you are falling into the Tory trap. This idea that ordinary voters don’t trust Labour with the economy is Tory propaganda designed to undermine left wing Labours credibility. If only Labour supporters would take every opportunity to undermine the Tory lies and lay bare their falsification of the truth. Fighting from within like Blair did nothing for ordinary people and Ed Millibands pathetic attempt at leading had nothing to do with leftwing policies just his incompetence. With Corbyn we have someone who has a clear vision and plenty of support for his socialism as witnessed by those Labour voters who opted for the socialist SNP manifesto.